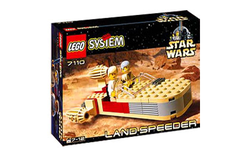 7110 Landspeeder is a Star Wars set released in 1999. It features Luke's Landspeeder as well as Luke Skywalker and Ben Kenobi minifigures. The set features a tan-coloured landspeeder with some grey and red. The speeder can seat two minifigures, and also has a transparent windshield. Three engines are mounted at the back of the speeder- one on top, and one on each side. The set includes two minifigures- Luke Skywalker, and Ben Kenobi with a lightsaber. Luke Skywalker owned an X-34 landspeeder on Tatooine when he was a farmer and used it as a transport. When Luke left with Ben Kenobi to deliver the droid R2-D2 to the planet Alderaan, Luke sold the landspeeder. This is a description taken from LEGO.com. Please do not modify it. Explore Tatooine in the Landspeeder! Race over the sand dunes at Tatooine with Luke Skywalker and Obi-Wan Kenobi in this high speed landspeeder. Three turbine engines give you the speed you need to escape from the Imperial stormtroopers and other dangers. Also includes lightsaber for Obi-Wan Kenobi. Explore Tatooine in the Landspeeder! This page was last edited on 30 July 2016, at 02:52.